This is how Natalie dressed herself for school earlier this week. Please note the position of her collars. I believe she might have gotten some 1980s fashion sense in her genetic code. I think I'll use this long weekend to teach her to peg her jeans. Tight-rolled jeans are the best! How else can one draw attention to post-baby hips!? She looks so cute, flipped collar or not. 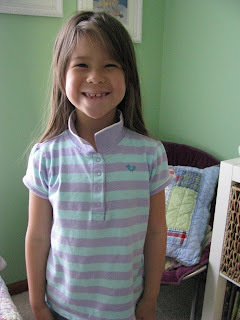 One of my boys always flips the collars of his polo shirts, too. I flip them down. He flips them up. And so on. Oh dear me NO! Not the pegged jeans!!! I like the collar, though! Hey, love the new look around here!